That about sums up the last few days. DARK could work as well. The type of DARK you notice at 3 pm when it looks like. 8 pm outside. Weather report just on, “RAIN for the rest of the day, with wind gusts up to 50 mph.” My goal is to stay inside with my nose to the grindstone. 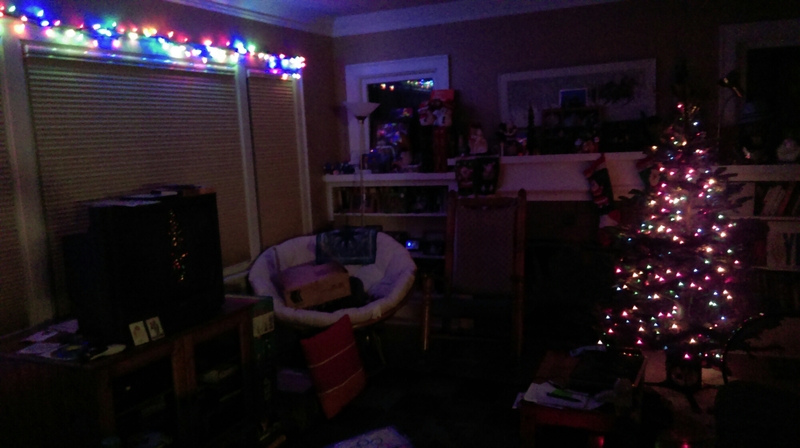 We have literally lightened things up at home by putting up lights. On the tree, a window here and there, and in the kitchen. Stumbling towards Christmas. Pictures to follow when I get back home. Speaking of lights, when we departed on an errand on Sunday, the sound of sirens here and there filled the air. We saw at least 5 police cruisers exiting the freeway and infiltrating the neighborhood at freeway speeds. It turns out this was a multiple car jacking, accident causing, shots fired on the run car chase. It skirted our neighborhood. The Seattle Times posted a compiled dash cam view of the chase. We could tell where they were, including an extended drive the wrong way up Roosevelt. The chase ended with a shoot out, although you can’t really see anything graphic. This entry was posted on December 8, 2015 at 8:53 am and is filed under Uncategorized. You can follow any responses to this entry through the RSS 2.0 feed. You can skip to the end and leave a response. Pinging is currently not allowed. I saw that on the news in St. Louis, but didn’t realize how close it was to your neighborhood. Crazy days on Planet Earth!